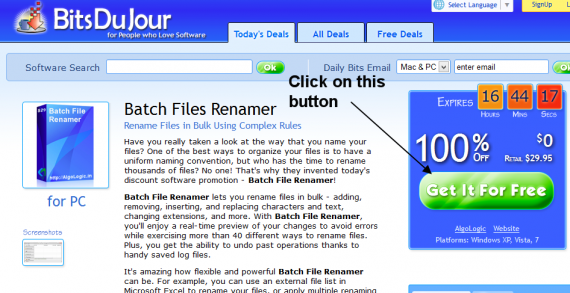 Batch Files Renamer is a software which lets you rename the file-names of several files at once. Batch File Renamer lets you rename files in bulk – adding, removing, inserting, and replacing characters and text, changing extensions, and more. With Batch File Renamer, you’ll enjoy a real-time preview of your changes to avoid errors while exercising more than 40 different ways to rename files. Plus, you get the ability to undo past operations thanks to handy saved log files. 1. Go to the promo page. 2. Click on Buy now (even though we aren’t really buying it). 3. Fill up the form and click on Complete Checkout. You should get an email with the download link. Just download the file and install the software, you don’t need any license code for it.